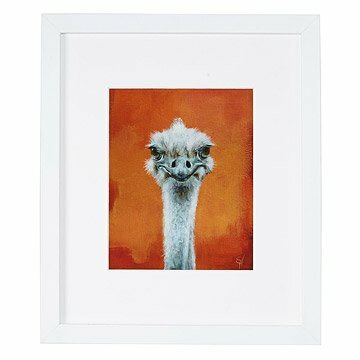 Invite an offbeat bird to your home with this print of an enigmatic ostrich. Spring Hofeldt"s study of the offbeat characters of the animal kingdom casts these ostriches as your loveably awkward friends or favorite social critics. Against a vibrant orange backdrop, Ned levels his gaze and purses his beak as if to say "meh." Each ostrich portrait is printed using acid-free paper and presented under an acid-free mat and Bonanza wood frame. Made in the USA. Read a Q&A with Spring on our blog, then take a peek into her beautiful studio. For more from this collection, meet Otto , Francine, and Squawk. I love it!!! It makes you smile and warms your heart it is so adorable. I have all four ostriches and they all look so lovely together. Adorable print! And expertly shipped (I got it framed). I got this for my daughters nursery. It is quirky and bright. The print is exactly what I wanted. I would highly recommend. I was also impressed with how well it was packaged. I ordered the framed version and had some apprehension as I've gotten glass items shipped from other companies that were just decimated en-route but this was packaged super well and came in perfect condition. Nice prints. They look like the image in the catalog. I wish they weren't matted, however, because now they need custom framing.